Pelicans are fascinating, gigantic, majestic birds with wingspans as large as 10 feet, that inhabit almost every continent, except Antarctica. They fly in large flocks, and can soar up to heights of 10,000 feet. Thousands of pelicans swarm together in a V-formation and travel great distances. Their vocalization somewhat sounds like chesty rumbling or as deep growling. 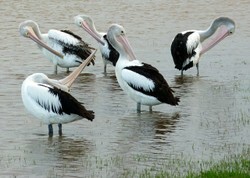 There are eight living species of Pelicans in the world. Most of them live in warm regions around coasts and river estuaries, where they feed on everything from fish and crustaceans to tadpoles and turtles. When hungry, they might even down and swallow a seagull. Most of them will fish in groups. They beat the water with their wings to drive fish into the shallows and then scoop them up with their bills. Although they are some of the heaviest flying birds, each bird's skeleton only amounts to one-tenths of its body weight, which in some cases can be over 30 pounds. Air sacs in their bones give them extra buoyancy. They also have air sacs beneath the skin on their throat, chest and beneath their wings, which are connected to their respiratory system. Aside from making them lighter and helping them float, the air sacs also improve flight aerodynamics. 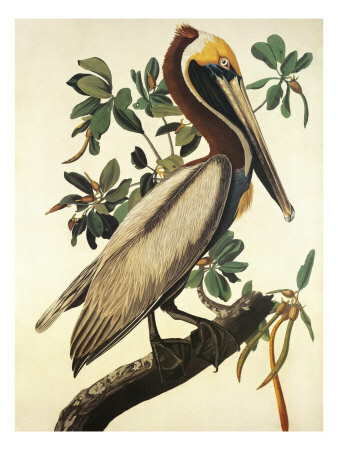 Examines the pelican, describing its habitat, physical characteristics, behavior, and relationship with people, with an emphasis on the brown and white pelicans. The Australian Pelican (Pelecanus conspicillatus) is found across Australia and New Guinea on many inland and coastal waters but tends to avoid very dry desert regions. It is the largest of all species found worldwide. It also occurs in Indonesia, Newzealand, and some pacific island countries close to Australia. The females are slightly smaller than the males. Their plumage is white and their primary wing feathers are black. They also have black markings on their tails. They prefer large open water sources such as fresh water and salt water lakes, rivers, swamps, lagoons, and coastlines that do not have too much aquatic vegetation. They live in large colonies composed of several hundreds of birds. Both males and females are in charge of the building of nests, that are usually located on trees near the water. Nests are built using feathers, leaves and sticks. 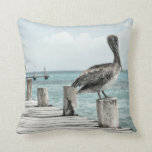 The Brown Pelican (Pelecanus occidentalis) is a large dark brown bird, with white to a pale yellow neck, black feet and legs. Its most distinguishing feature is a hooked tip and a huge pouch. These birds breed from Anacapa Island California South to Chile and from Maryland to Venezuela. They are strictly marine in habitat and are never found more than 20 miles away from the sea. They are gregarious birds that travel in flocks and hunt cooperatively. The American White Pelican (Pelecanus erythrorhynchos) has an entirely white plumage, except for black primary and secondary remiges, only visible in flight. Globally, the Pelican population is adversely affected by declining supplies of fish, destruction of habitat, human activities at nesting colonies, entanglement in fishing hooks, and presence of DDT, endrin and other pollutants in water and on the coasts. The Dalmatian Pelican (Pelecanus Crispus) is the rarest of all species and is endangered with the ongoing threats such as hunting, collision with overhead power lines, oil spills, and overexploitation of fish stocks.